Discontented with existence on the ship, Seamus decides it’s time to do what he’s been avoiding for six decades. Though he knows his wife and best friend teamed up to murder him, there are things about the crime he doesn’t understand, as well as emotions he hasn’t yet been able to face. With fellow Dead Detective Ronnie to assist, Seamus returns to 1953 to face his memories and answer questions that remain about his death. In a world much different from today, in an America where questions of social justice are just beginning to be addressed, the two detectives find lots going on under the surface. Chicago offers opportunities for crime on many levels, and there’s always someone around to take advantage of those with secrets. Seamus learns a shocking truth about his wife and the secret she kept from him that eventually led to his murder. In the end he and Ronnie must work to save the lives of two young cops brave enough—maybe foolhardy enough—to try to discover what really happened the night Seamus Hanrahan died. 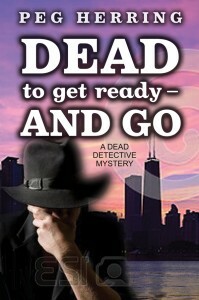 I have no idea where the Dead Detective scenario came from, but after THE DEAD DETECTIVE AGENCY was chosen Best Mystery of 2012, two more Dead Detective books followed that were fun to write and well-received by readers. I had a strong sense that this would be a four-book series, so once DEAD FOR THE MONEY and DEAD FOR THE SHOW were released, I knew the last book would be Seamus’ search for answers to his own murder. That meant going back to 1953, to the night of his death, and the questions that remained. I hope readers will be happy with Seamus’ last case, the fascinating Chicago atmosphere, and the answers found in a night club along the river. Seamus is the old-fashioned kind of detective–wide lapels, fedora, and wing-tipped shoes–but it isn’t a fashion statement. He lived and died in the 1950s, and though he’s learned to operate in the decades between, he’s most comfortable in an age when a guy’s ability to figure things out was more important than DNA and cell phone records. Throughout the series, I knew Seamus would believe his wife had him killed, but getting her character right took some time. Why does he believe Lee would kill him? What was she up to? How did it happen? I think readers will enjoy meeting Lee Hanrahan and getting to know the differences between the girl Seamus thought he knew and the real Lee. Bored was an impolite term, considering the wonders of the Afterlife, but that’s what Seamus was. Perfect meals, endless entertainment, and unfailingly pleasant companions bored him. There was something else, too, but he didn’t know what to call it. Seamus regularly and purposefully relived the last moments of his earthly existence. Each time, he was shaken and confused at the outset, overcome by dread somewhere in the middle, and at the last moment, blessed with a kind of fatalistic acceptance. It was always the same. He emerged from a cocoon of pain, unable to move, speak, or see. His feet were bound tightly at the ankles, his hands behind his back. The ropes bit into his wrists, and his hands felt like bricks at the ends of his arms. It was bitterly cold, and he lay against a fish-scented wooden surface. A thin coat of ice stung the spot where his cheek rested. It hurt, but he recognized that what came next would be far worse. Vague impressions circled his mind, but the pain stopped him from sorting them into usable bits of information. Think! he ordered, but his brain couldn’t obey. Water lapped around him. Thumps sounded, and movement beneath rolled him gently back and forth. He was in a boat. A familiar voice spoke above him, and it seared his soul to hear it in this time and place. “Is Seamus dead?” she asked. He wanted to say something, but all that came out was a muffled groan. A burst of noise assailed his ears, and his weight shifted abruptly. His head struck against something, and he lost the ability to think for a while. The chug of a motor coming to life brought awareness back. Seamus felt the tug of movement, backward a few feet and then forward, slowly at first but picking up after a few minutes. The motor whined as unseen hands guided the boat around a few slight turns. The air became even colder, and the ice under his cheek burned like a blowtorch. After perhaps ten minutes, the irritating whine lessened and the boat slowed. The growl became a purr, and movement all but stopped. They’d reached their destination. The hands released him. He felt a brief sensation of flying, followed by a jerk at his ankles. Something heavy had been attached to his feet. He felt its pull as it hit the water first and began its descent to the lake bottom, dragging him with it. When the icy waters of Lake Michigan closed around him, Seamus was already half dead. It didn’t take long for what was left of his life to be sucked away. Coming out of the waking nightmare with a violent shiver, Seamus gasped for air he no longer needed. He gripped the heavy railing with both hands. It felt solid and real, though that was an illusion. The ship was an illusion provided to those traveling from life to What Comes After. He was as dead as everyone else on board, immune to the “thousand natural shocks” the living face each day. Here there was no fear, no pain, and little real emotion. Existence was comfortable, reassuring, and luxurious.